It was a local disaster. It was one of the biggest things to happen in the Point/Plover area in modern history. People’s houses were ravaged by nature’s most destructive force. March 15, the Friday before spring break, torrential downpours mixed with three feet of melting snow led to possibly the fastest melting season we’ve ever had. Dozens of businesses and houses were overtaken by the backed up water that had nowhere to go. Carpets ruined, walls soaked, books set afloat. Thousands of dollars in damage. Cleanup to this day. According to the Insurance Information Institute, water damage is the second most expensive insurance claim and the second most common insurance claim in the United States. Water-related disasters are the second most destructive occurrence worldwide. The damage what was done to Plover is nothing compared to the hurricanes and tsunamis that happen in other parts of the world but some people’s homes still took major damage. A few local residents have some strong feelings about what happened to their residencies. “I had to bail out my basement with a bucket, and I couldn’t find my pet hedgehog,” Eathan Zimmerman, a victim of the flooding, said. Some tried to make the best out of a bad situation. “I could ride my kayak down the street,” Brendan Bostic said. Others had trouble fighting the water themselves. “I think I got trench foot from the flooding,” Ian Poeske said. If you did get serious water damage in your home and you haven’t cleaned your house yet. You can get help. “One of the major things you should look out for especially after all the water is gone is mold.” You can find tips like this at http://www.ploverwi.gov/. They would also like everyone to know curbside brush pickup will begin April 15. The compost site will open April 18. Yard waste pickup will begin April 22. 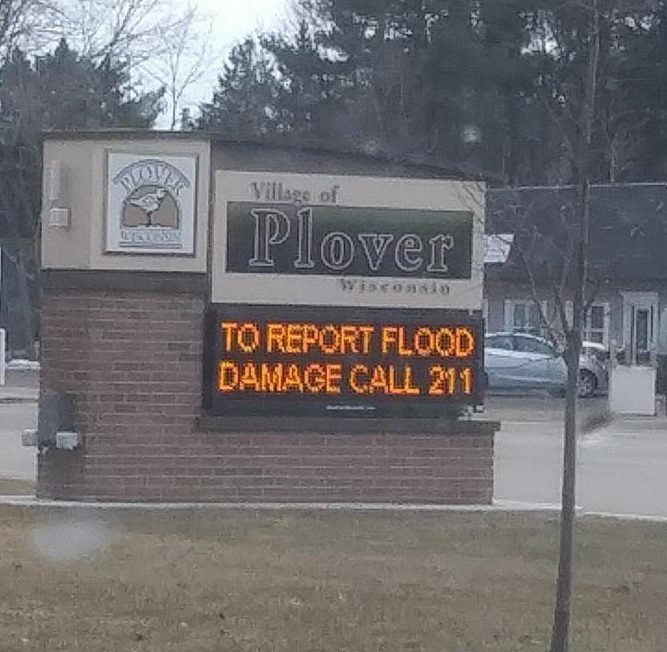 Call the number in the photo if you have any flood damage to report. Even if it looks like it’s going to be done raining for a while there is still some snow on the ground and with the crazy weather we’ve been having this year, it would be best to prepare for the worst. Nice job on the article! I have heard a lot about the flooding and I know it was a really big issue for a lot of the community. I have some friends that were experiencing some pretty bad flooding issues so this article caught my attention. This article was very informative. This year is definitely the year where water damage because of too much snow had severe impact on several residents, including myself. I’m glad, that it is all over now. Overall, good article. I enjoyed reading your piece.